Beyond Good and Evil was a really great game, not necessarily due to the gameplay (which was definitely solid), but due to its incredible art direction and unique sense of place. It was really unlike anything available at the time, or even today for that matter. 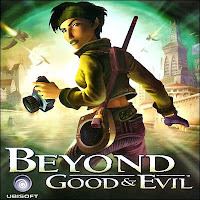 Games this original don't come along very often, and for good reason: Beyond Good and Evil sold poorly. In addition to the game's look and style, BG and E's soundtrack was also quite memorable. (In particular, I loved the "Propoganda" song in the Akuda Bar.) Well, in honor of its recent HD re-release, UbiSoft made the game soundtrack available for free! Unfortunately, it was only available for a short time, and I found out too late. Being a sucker for game music, I quickly found the MP3s elsewhere on the web, but some of the tracks were missing. (I stubbornly refuse to download torrents.) Ubi still has an official link to the soundtrack, but be warned that it only contains 1-minute samples of each track. If you're on the hunt for the complete Beyond Good and Evil OST, I found a random link to all the MP3 files here.